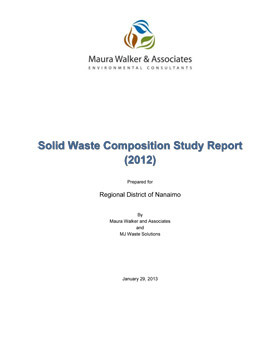 In 2012, the Regional District of Nanaimo (RDN) commissioned a follow-up to its 2004 study of the composition of waste being landfilled in the Region. Completed over five days in October at the Regional Landfill and Church Road Transfer Station, the 2012 Waste Composition Study provides important baseline information on the present nature of the solid waste stream and its changes over the past eight years. The 2004 Waste Composition Study guided the development of Zero Waste programs and policies resulting from the 2005 Solid Waste Management Plan. The study identified compostable organics (food waste and compostable paper) and construction/demolition waste as the largest components of waste by weight being landfilled. These materials were targeted for diversion from the landfill through residential food waste collection (the Green Bin Program), and disposal bans on Commercial Food Waste and Clean Wood Waste. The 2012 Waste Composition Study is a key tool in the current process to update and review the region's Solid Waste Management Plan (SWMP). The study's findings have been used to assess the effectiveness of Zero Waste programs in diverting landfill waste and opportunities for improvement. Compiling data using methods that enable greater comparability with studies completed in other BC jurisdictions. In 2012 the annual rate of waste landfilled in the region was 350 kg per capita compared with 450 kg per capita in 2005. By participating in programs such as the green bin and commercial food waste diversion, residents, businesses and institutions have achieved one of the lowest per capita disposal rates in Canada. 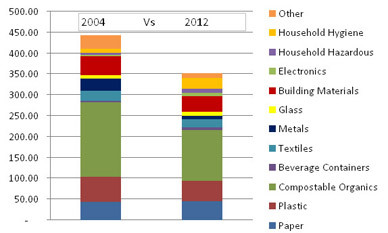 As the chart above illustrates, significant progress has been made by diverting wastes from the landfill, which were targeted in the 2004 SWMP. Compostable Organics (food waste and compostable paper) have decreased by 31 per cent and Building Materials (construction/demolition waste) have decreased by 19 per cent compared with 2004 levels. Research indicates recycling rates for multi-family dwellings are lower than single family homes. This could be improved with more education on the recycling opportunities for multi-family residents. Food and organic waste remains the largest source of commercial/institutional garbage. Greater participation from this sector could divert more of this waste to local composting facilities. Single family homes now divert more than 60 per cent of their garbage from the landfill through curbside food waste and recycling collection. Food waste and recyclable material remain the largest component of residential waste and more can be captured through curbside programs. Residents could also divert more by using Product Stewardship depots for material such as used electronics and refundable beverage containers. 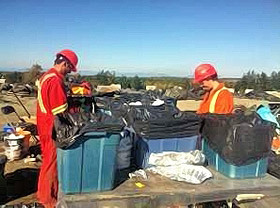 Waste sorters separate materials at the Regional Landfill for the 2012 Waste Composition Study. Please [ Click Here ] to download the 2004 Solid Waste Composition Study.